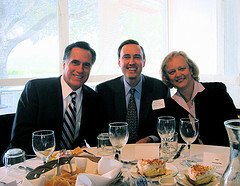 Meg Whitman – Political & Current Affairs Blog Published by Celeste Greig. California Republican Party Chair in 2010 was Ron Nehring—he told the delegates we had a responsibility to join the effort to elect Meg Whitman for Governor, since she was the GOP nominee (this is when it was legal to nominate candidates for partisan office). Though she was a very liberal Republican, having few values or principles of the Party, no background in support of the Party—her only effort had been to raise money for George Romney, who helped her financially years before in the corporate world. Whitman had never attended a State Party meeting, a County Committee meeting or a GOP volunteer club, in her life, till she decided to be a Republican to run for governor. In fact, it had been many, many years, since she even voted. Now, the woman who demanded Republicans support her because she was registered as a Republican is telling the GOP to go to hell, she will support the most ethically challenged candidate in the history of the nation. The good news is that there is no hope of her ever attending a GOP event ever again. I presume the Bush’s, Romney, Whitman and their friends will also stay away from the Republican Party in the future—if they endorse anybody, for any office, that person is a sure loser in a real Republican primary. I fully expect that CRP Chair Jim Brulte will send out messages, promote the volunteer efforts and use the CRP resources to maximize the votes for the Republican candidate for President, Donald Trump. Reports are circulating that Meg Whitman, a high-profile Republican donor, is considering supporting Hillary Clinton instead of Donald Trump. Whitman, the CEO of Hewlett Packard Enterprise, has a long history with the Republican Party. She was the finance co-chair for Romney’s and Chris Christie’s presidential campaigns,and she launched an unsuccessful bid for California governor in 2010. Whitman also grilled House Speaker Paul Ryan at the summit about how he could throw his support behind Trump. One source told Politico she even compared Trump to Adolf Hitler and Benito Mussolini. Whitman seems to be in a similar position to a lot of Republicans, who want to stay loyal to the party but are unwilling to support Trump. Even after Trump secured enough delegates to win the party’s nomination for president, some Republicans are still speaking out against him. “Presidents have an impact on the nature of our nation, and trickle-down racism, trickle-down bigotry, trickle-down misogyny, all these things are extraordinarily dangerous to the heart and character of America,” Romney told CNN. Whitman reportedly didn’t say whether she would be throwing her financial support behind Clinton or just her vote.